Here you’ll find the seven best beaches in Cozumel near cruise port. When most people think of Cozumel, Mexico, they imagine white sandy beaches with miles of powder-white shoreline. Surprisingly, most Cozumel beaches are NOT pretty. The majority of the island’s coastline is rocky. Only a few small sections offer the tropical beach experience most cruise passengers are hoping for. Cozumel is a long and fairly narrow island just off the coast of Mexico. From north to south, the landmass is 30 miles long. From east to west Cozumel is only 10 miles wide. Much of the perimeter is lined with jagged rocks and not inviting to those wanting a day at the beach. Of the few popular spots, some are good for snorkeling while others are best for lounging in the sun. 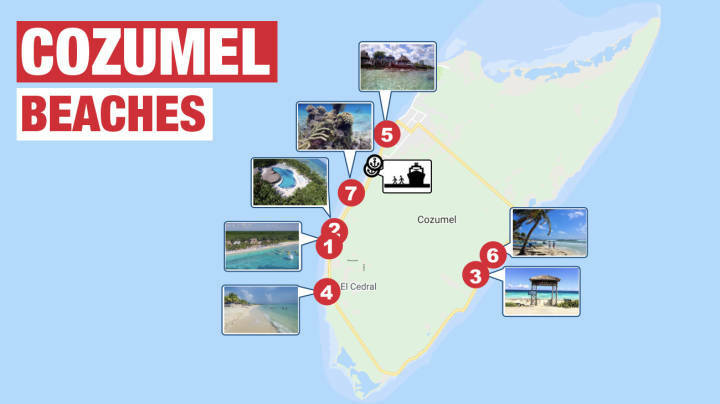 We’re here to lay out the seven best beaches in Cozumel near cruise port. Whether you’re looking for a private beach getaway, a convenient place for your family, or an underwater snorkeling adventure, we’ll have your best beach option below. In general, the west side of Cozumel (the side facing Mexico) has much calmer water. It’s also protected allowing coral to thrive. The east side (the side facing the Gulf of Mexico) has much larger waves and stronger currents. This makes it worse for swimming and snorkeling, but great for sweeping ocean (or Gulf rather) vistas. Your options on this far side of the island also have much smaller crowds than west-side beaches near Cozumel cruise port. Playa Corona is a very popular option for snorkelers looking to stay near Cozumel cruise port. It’s not the best snorkeling and not the nicest beach, but is a convenient option for those looking to fill an hour or two in between other things to do. How much will a taxi cost to Playa Corona? Playa Corona is one of the best beaches in Cozumel near cruise port for those looking for convenience. Located just southwest of your cruise port, you’ll pay only $13 for a taxi each way. To see taxi costs from your specific port, please check out our Cozumel taxi fare post showing rates to all attractions near port. We also share one cruise hack to save 50% on your cab fare! This public beach is typically less crowded than other options mentioned here. However, it’s used for excursion companies to launch their tours. On occasion, large groups of snorkelers will assemble and depart from here. There’s not much “beach” to this beach, so beach-going crowds tend to flock to sandier options. How is the beach at Playa Corona? If you’re looking for soft sand and endless stretches of beach, this is NOT a good choice. You won’t find anywhere to lay out and dig your toes in. This is a great option for snorkelers, but terrible for sandcastles. Is Playa Corona good for snorkeling? Yes, absolutely. This is one of your best options for snorkeling near Cozumel cruise port. Typically, cruise excursion companies charge $45 to take you here, hand you equipment and send you snorkeling. Instead you can skip the middle man and head here yourself. Rather than spending $90 for two people, you’ll spend $26 in cab fare. You can use that extra $64 to buy snorkeling gear to use throughout your entire cruise. Some cruise passengers report being charged and entrance fee at Playa Corona. We’ve heard claims of $5 and even $10 per person. You should not have to pay this. If you plan to eat at the restaurant, it’s easy to convince them to apply this $5 or $10 to your bill. But, if not planning to eat, you still shouldn’t have to pay this fee. Even if not using any of their facilities. Playa Chen Rio is popular for passengers looking to get away from Cozumel cruise port and to avoid crowds. It’s on the clear other side of the island so the deeper waters are unprotected from the Gulf of Mexico’s waves and tides. The currents are significantly stronger and waves larger. If looking for a beautiful and scenic beach, this is a great option. If hoping to swim all day, you’ll want to stay on the other side of Cozumel. There is a shallow area protected by a reef that serves as a great “tide pool” for lounging. You won’t find many amenities at Playa Chen Rio. If ordering food, you can use the bathrooms at the restaurant. Otherwise, you’re on your own. This is why families might want to look for more convenient options. How much is a taxi to Playa Chen Rio from Cozumel cruise port? You’ll spend more on a taxi to get to Playa Chen Rio than most other beaches near Cozumel cruise port. It’s on the east coast of the island and your cruise terminal is on the west. Expect to pay roughly $30 each way. It’ll take about 25 minutes for your cab to cross over the mid-island thoroughfare. For exact costs, check out our cruise taxi fare post cited above. We also provide a tip to save 50% on your cab fare. Is Playa Chen Rio crowded? No, Playa Chen Rio is one of the most secluded beach options in Cozumel. This is one of the furthest of our best beaches in Cozumel near cruise port. As such, you’ll run into many less of your cruise ship passengers. However, if your cruise itinerary has you here on a Sunday then expect a crowd. Locals have a tradition of gathering here on Sundays and it can get a bit crowded. Is the beach at Playa Chen Rio nice? Playa Chen Rio has more of a “natural” look than the beaches found at resorts. You’ll find vegetation leading up to the sand. Also, expect small amounts of seaweed on the beach and in the shallow waters. Conditions change with the weather, but the sand tends to be gorgeous and a great option for those looking to dig their toes in. Is Playa Chen Rio good for snorkeling? There’s a shallow, protected area for wading. This might be good for kids looking to snorkel. However, if you’re hoping to see fish, coral, and deeper underwater environments, we’d choose a different beach option than Playa Chen Rio. As it’s on the eastern side of the island, the waves and currents cause for unsafe swimming and murky snorkeling conditions. You’ll have access to restrooms detached from the little restaurant on the beach. If you’re hoping to grab a bite to eat, or cold beer, make sure to bring cash. The restaurant does not take credit card! Sunset Beach is one of your closest beach options regardless of the Cozumel cruise terminal your ship is docked. It’s also one of the most popular for those looking to snorkel while in port. The Sunset Beach Restaurant is located adjacent to the shore and provides amenities for visitors. While there’s technically not an entrance fee, it’s common that cruise passengers will dine or have a drink here. Food and drinks here are reportedly better than found at Playa Corona noted above. On the property, you’ll also find Sand Dollar Sports and Snorkel shop where you can rent gear like snorkeling or scuba equipment. Here you can also take part in a number of different water-sports, from scuba to flyboard! How much will a taxi cost to Sunset Beach? Sunset Beach is one of your cheapest taxi options from Cozumel cruise port. The attraction is situated just northeast along the shore, nearby downtown San Miguel. Expect to pay roughly $8 for cab fare. For exact costs, check out our cruise taxi fare post cited above. We also provide a tip to save 50% on your cab fare. The beach is near the cruise port and popular among snorkelers. On days with many ships in port, expect it to be a bit congested. There’s not a “beach” area of Sunset Beach. Rather than sand, you’ll find steps to get into the water for snorkeling access. As such, it might be a bit of a bottleneck at times. Is the Beach at Sunset Beach nice? No, there’s really not a “beach” at Sunset Beach. If you’re hoping for white sand and lounging, this is not a good option. It’s popular for those looking to snorkel or for restaurant views. There are much better options if hoping for long walks on the beach. Is Sunset Beach good for snorkeling? The scuba shop adjacent to the beach offers equipment rental. Also available are scuba tours and other exciting water-sports options. An organized snorkel tour with equipment and instruction will cost you $24 here. Sunset Beach is great for groups in which some want to snorkel or scuba while others would prefer to relax. It’s not uncommon for family members to frolic in the water while parents or others are enjoying lunch and drinks at the restaurant. Playa Palancar offers some of the whitest sand and largest stretches of beach in Cozumel. You’ll encounter multiple beach clubs on this strip of coastline offering an upgraded experience to cruise passengers (more below). Access to Playa Palancar is free. You’ll have access to bathroom amenities and changing rooms free to use for guests. You’ll also have access to vendors providing all of the necessary rentals you might need, like snorkeling gear, kayaks, jet skis, chairs and umbrellas ($10 for the day), day beds, excursions and of course food and drink. How much is a taxi to Playa Palancar? Playa Palancar is not the closest free beach near Cozumel cruise port. It’s situated about 20 minutes south of where your ship will be docked. Depending on your terminal, you may pay slightly more or less than $25 each way. For exact costs, please check out our Cozumel cruise port taxi fare schedule noted above. In that post, we’ll also give you a tip to save 50% on your cab cost. Playa Palancar is on the smaller side compared to many Caribbean beaches. It’s also one of the more popular options. You can expect the beach to be more crowded than the options we mentioned on the other side of Cozumel. If you’re looking to avoid the crowd but to still take advantage of this great beach, check out some of the upgraded options noted below. Is the beach nice at Playa Palancar? Playa Palancar is one of the best beaches in Cozumel near cruise port for those looking for soft, white sand. Compared to other options on the island, you’ll find the sand to be softer, the beach to be larger, and the surrounding landscapes more scenic. Much of Cozumel’s perimeter is jagged rock, but this stretch of coastline is the picturesque, tropical beach you’re expecting from the Caribbean. Is Playa Palancar good for snorkeling? Playa Palancar is not known for exceptional snorkeling. You won’t find the reefs and colorful fish that you’ll get in other Cozumel beaches near cruise port. The abundance of swimming and water-sports activity makes for a poor snorkeling experience. If you’re looking for snorkeling options, you’ll find some great excursion options for as little as $30 here. For an upgraded experience, check out a resort day pass option in Playa Palancar. For a reasonable fee, you’ll have full access to resort amenities like beach chairs, umbrellas, swimming pools, towels, water-sports equipment and more. Here are your best option for a resort pass at Playa Palancar. The Iberostar Cozumel has an All Inclusive option for $72 that provides every luxury you’ll need. In addition to the beautifully manicured beach, you’ll get access to their premium beach chairs, restaurant and bar, multiple swimming pools with swim-up bar, tennis courts, volleyball court and fitness center. Snorkeling equipment is included as well as non-motorized water sporting equipment like kayaks and hobie cats. All of your food and drinks (including alcohol) are also included! It also has a children’s area if you have little ones. Click through to see if your dates are still available. Playa San Martin is the furthest of all of our recommended beaches near Cozumel cruise port. Like Playa Chen Rio, it’s situated on the opposite side of the island as your cruise port. To get there, your taxi will go straight across the island and a bit south. Visitors love how exclusive this beach is compared to those on the port side. It’ll take an extra 10 or 20 minutes in a cab, but definitely worth it for those looking to avoid the crowds. How much is a taxi to Playa San Martin from Cozumel cruise port? You’ll spend more on a taxi to get to Playa San Martin than other beach options in Cozumel. It’s on the east coast of the island and your cruise terminal is on the west. Expect to pay roughly $30 each way. It’ll take about 25 minutes for your cab to cross over the mid-island thoroughfare. For exact costs, check out our cruise taxi fare post cited above. We also provide a tip to save 50% on your cab fare. Is Playa San Martin crowded? No, Playa Chen Rio is one of the most secluded beach options on the island. This Cozumel beach is significantly further away from port and from your fellow cruise passengers. There are few amenities other than the restaurant (El Diablo) just across the street. You can expect few if any vendors here, so make sure to bring most of what you need. Is the beach at Playa San Martin nice? Playa San Martin has some of the best sand of any beaches near Cozumel cruise port. The views will be spectacular as you watch the waves crash down on the coastline. You’ll have a long stretch of beach to choose your ideal spot and few people to contend with. Is Playa San Martin good for snorkeling? Playa San Martin is not good for snorkeling. The rough waters make for a murky view and dangerous conditions. We wouldn’t advise this beach (or this side of Cozumel) if you’re looking for a full day lounging around in the water. Beaches on the other side of Cozumel are much more swimmer-friendly. Across the street at El Diablo, there are restrooms. If you’re not planning to eat, you can still use them for a small fee of $1. Playa Mia resort is a great option and another of our recommendations for best beaches by Cozumel cruise port. It’s the most expensive of all of our recommended options, at roughly $30 (starting price). Although, that it includes everything you’ll need in a beach day. And for that price, it’s still significantly less than many excursion options. We particularly recommend this beach option for families visiting Cozumel. We understand how hectic it can get with little ones running around. They need to be constantly fed, entertained and provided with all the amenities necessary to keep them safe and clean. This place has it all. This beach club has everything you need including clean facilities, waterpark, children’s section, restaurant, pool area, and much more. There’s fun for the entire family at Playa Mia beach club. How much is a taxi to Playa Mia? Playa Mia Beach is one of the closest beaches near Cozumel cruise port. A cab should take roughly 15 minutes and cost just $18, give or take a couple bucks depending on which Cozumel cruise ship terminal you’ll be docking. For an exact price, please see our Cozumel Taxi fare schedule. Is Playa Mia Beach crowded? Given that it’s one of the closest beaches near Cozumel cruise port and so popular with families, you can expect fairly larger crowds. They’ve added every amenity and convenience that a family could need, and many take advantage of this. You can expect more little ones than at any of our other options! If you don’t have kids of your own, and would like an older audience, we’d suggest somewhere else. But, if you’re coming with the family, this is your absolute best beach option in Cozumel. Is the beach nice at Playa Mia? This is one of the best beaches in Cozumel near cruise port. The sand is very well maintained by the resort. Expect the soft, white sand that you’d picture when thinking of a tropical island. That’s what you’ll get here. It’s also one of the widest stretches of beach on the island. Is Playa Mia good for snorkeling? It’s great for snorkeling but not for the typical underwater explorer. It’s on the west side of the island, which makes for safe swimming and calm waters. But, don’t expect to see a lavish ecosystem with colorful reefs and rare fish. Instead, you’ll have access to the underwater Mayan City that Playa Mia has sunken there for exploration. While it’s not the most natural environment to snorkel, it’s still a great time. You can bring your own snorkeling gear or rent it from Playa Mia for $15 for the day. You can find Playa Mia package deals to save a lot of money versus the “pay as you go” method once there. For instance, Playa Mia charges $30 just for entrance fee, but here you can get access to the Playa Mia resort AND a buffet lunch for $29.95. Or, if you’re looking for full access to everything the resort has to offer, including open bar, we’d go with the All Inclusive Playa Mia pass for $60. If you like the idea of an all-inclusive beach club, but want to explore all of your options. Check out our list of Top 9 All Inclusive Beach Clubs in Cozumel. Playa San Francisco is probably the most popular of all beaches near Cozumel cruise port. Although, people know it more so by the beach clubs that inhabit its shoreline. Particularly, Mr Sanchos and Nachi Cocom. These are two of the most popular destinations while in port. Not only because they’re situated on the best beaches in Cozumel near cruise port, but also because of their all-inclusive option. We’ll start with Nachi Cocom, the second most popular beach destination near Cozumel cruise port. What does a Nachi Cocom day pass cost? For all inclusive access to the resort, you’ll pay only $55. That includes your admittance, beach and pool access, food and also drink (including alcohol). Considering all that’s included, this is a steal. We imagine that’s why it typically sells out so quickly. How much is the taxi to Nachi Cocom? A taxi from Cozumel cruise port to Nachi Cocom will cost about $18. Depending on which port you’re arriving, you can give or take a couple bucks. The total travel distance from port to resort is about 20 minutes. Nachi Cocom will never have a large crowd. They put a maximum capacity on the number of cruise passengers (or others) that can occupy their property on any given day. That number is only 130! It’s likely that your ship has over 2,500 passengers, so that’s less than less than 5% that are allowed in at one time. Is the beach nice at Nachi Cocom? Nachi Cocom (Playa San Francisco) is considered one of the best beaches in Cozumel near cruise port. The resort takes great care to maintain the sand and coastline. Their beachfront consists of powder white sand and perfectly clean stretches of beach along the entire property. Is Nachi Cocom good for snorkeling? Nachi Cocom is not particularly great for snorkeling. The waters just off shore are good for swimming, as they’re relatively calm and without strong currents. But, you won’t see colorful reefs and an extravagant underwater environment here like you would others. Snorkeling gear is not included in your day pass, but the resort does offer a snorkeling excursion for $38. Located a quick swim or stroll up the coast is the neighboring cozumel beach club resort, Mr Sanchos. This is the most popular excursion option we’ve ever seen. It’s very similar to Nachi Cocom in that both occupy the best beaches in Cozumel near cruise port. The main difference is that Mr Sanchos is a bit “livelier.” You’ll find that cruise passengers here like to take advantage of the all-inclusive piece a bit more so than at Nachi Cocom. What does a Mr Sanchos day pass cost? For all inclusive access to the resort, you’ll pay only $49.95. That includes your admittance, beach and pool access, food and also drink (including alcohol). Note that on Mr Sanchos web site, they sell this pass for $55. Follow our link to get it for $5 cheaper for $49.95 before it sells out! How much is the taxi to Mr Sanchos? Mr Sanchos will be a bit more crowded than Nachi Cocom for a couple reasons. While they too put a maximum capacity on their daily guests, this number is more than 3x as large at 450 visitors per day. Guests aren’t required to purchase the all-inclusive package to enter and are technically allowed to visit and enter for free. Guests without a pre-purchased ticket will be the first turned away if the capacity is reached, so we advise that a ticket is purchased in advance. Is the beach nice at Mr Sanchos? Mr Sanchos (Playa San Francisco) is considered one of the best beaches in Cozumel near cruise port. The resort takes great care to maintain the sand and coastline. The coastline of their beach club consists of powder white sand and perfectly clean stretches of beach along the entire property. Is Mr Sanchos good for snorkeling? Mr Sanchos is not particularly great for snorkeling. The waters just off shore are good for swimming, as they’re relatively calm and without strong currents. But, you won’t see colorful reefs and an extravagant underwater environment here like you would others. Snorkeling gear is not included in your day pass, but can be rented for an additional $20. If you’re even considering Mr Sanchos, book immediately and specifically through this link. Not only will you save $5 vs Mr Sanchos web site, you’ll also have the option to cancel at any time before 11 days prior to your arrival date. There’s absolutely no risk to lock in your spot and to make sure it doesn’t sell out first. You can always change your mind later for a full refund! That’s it for our 7 Best Beaches near Cozumel Cruise Port! We hope that this has been helpful in making the most of your day on shore. If you found this helpful, please use the share buttons below so fellow passengers can get value from this as well. Happy cruising! For an equally great guide, click here to check out St Kitts Best Beaches near Cruise Port or here to view this Best Nassau Beaches near Cruise Port Guide.